Playoff-tested Tayshaun Prince could have the right match-up against the Clippers. 6. TP3: The Clippers are associated with Chris Paul and Blake Griffin. The less starry Grizzlies with the trio of Zach Randolph, Marc Gasol, and Mike Conley. But if Eric Bledsoe is the secondary player I see as most crucial for the Clippers' hopes in this series, I think Tayshaun Prince could be the Grizzlies' wild card. Prince has been a very modest scorer for the Grizzlies since coming over at midseason, averaging only 8.8 points a game on 43/37 shooting, with his 9.1 field-goal attempts per game including only 1.1 three-points attempts. But Prince has been a bigger factor against the Clippers. In three games this season, including one when he still played for Detroit, Prince has averaged 15.3 points on 54/57 shooting, his minutes (31.7 average for Griz, 36.3 vs. Clips), shot attempts (12.3), and three-point attempts (2.3) all up. Though the sample size is obviously tiny, Prince's shot selection has been less mid-range dependent against the Clippers than it's been this season overall. And it's easy to see why that might be the case. None of the Clippers' small forwards — Caron Butler, Matt Barnes, and Grant Hill — are a deterrent to Prince's post game. Meanwhile, the Clippers have proven susceptible to both wing scoring and three-point shooting overall, so if Prince spaces the floor out more than is typical for the Grizzlies — and this was happening in last week's meeting between these teams — there will be open long-range looks. Prince has hit the 15-point plateau only twice in 37 games with the Grizzlies, one of those against the Clippers. But with favorable match-ups, an expected bump in minutes, and so much defensive pressure on the Grizzlies' backcourt, the bet here is that Prince does it a couple of times here if the series goes long and averages double-digits. Prince's ball-handling ability can also be a crucial release valve for the Grizzlies offense, giving the team a viable option outside the backcourt to advance the ball downcourt and initiate offensive sets, an adjustment the team made in the second half of the last meeting between these teams, after Eric Bledsoe had manhandled Griz guards in the first half. The lanky Prince could also be the catalyst in another potentially key element of the series: Three-point shooting. Last spring that was — unsurprisingly — a big advantage for the Clippers, who made six a game on 38% shooting while the Grizzlies made three a game on 29% shooting. There's good reason to think this disparity might even out this time. The Grizzlies were an average team in terms of defending against three-point shooting before the Rudy Gay trade, but have been the NBA's best in that department since. A more attentive Prince is less likely to surrender the kind of long-range barrage that helped the Clippers steal Game 1 last spring. Meanwhile, the Clippers have struggled to defend the three this season. In the two games between these teams since the trade, the Clippers and Grizzlies have each made 12 three-point field goals, but the Grizzlies have done so on 48% shooting to the Clippers' 29%. The key to threes in this series could be at the three, where the Clippers' Butler and Barnes averaged three makes a game between them in the regular season while the Grizzlies' Prince and Quincy Pondexter — who combined to shoot 8-15 from three against the Clippers this season — averaged a combined 1.5 a game. Winning the small forward match-up — overall but especially from three-point range — could be a quiet tipping point in the series. The numbers suggest Ed Davis should play a major role, but in his first playoff appearance, his minutes will be a mystery. 7. Revamped Benches: Outside of the obvious Prince/Gay exchange, the biggest difference between these teams compared to last spring is on the bench, where most of the players have changed. This gives the Grizzlies considerable hope on the front line, where Clippers reserve bigs badly outplayed their Griz counterparts in the 2012 series. Reggie Evans was a notorious difference-maker in that series, averaging nearly nine rebounds a game in about 22 minutes, playing more than starter DeAndre Jordan, often finishing games, literally throwing people around, and typically getting away with it. As a fourth big, Kenyon Martin played an unexpected 18 minutes a game and had a considerable impact, particularly in his isolation defense against Rudy Gay. Meanwhile, Grizzlies' back-up bigs were mostly a disaster. Marreese Speights was a mistake-prone net negative, but had to play anyway. Dante Cunningham proved too much the tweener for a Clippers team that, going against the grain, never played small at power forward. Hamed Haddadi had a moment in Game 6, but was put on an island setting picks in Game 7. 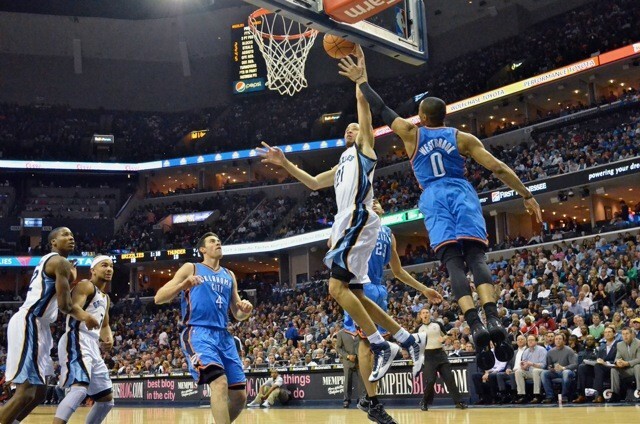 In all, the trio were mostly a 25-minute albatross behind Zach Randolph and Marc Gasol. The odds seem better for the Grizzlies this time around. None of the Clippers' reserve bigs — Lamar Odom (under 40% from the floor this season), Ryan Hollins, Ronny Turiaf — is likely to have the same kind of physical impact as Evans or even Martin. Meanwhile, the Grizzlies' duo of newcomer Ed Davis and back-from-injury Darrell Arthur promises to be an upgrade over the Speights/Cunningham tandem. Davis should be able to match Speights on the boards while doing a better job contesting shots around the rim and scoring more efficiently. Davis' playing time has been erratic — he played only two minutes against the Clippers last weekend — but his defensive presence at and above the rim could be an important dimension in the series. Arthur has had a disappointing season, especially since the back and shoulder injury that caused him most of March, but he played well in the last two regular-season games. Arthur is capable of big games with his combination of pick-and-roll defense, mid-range shooting, and ability to make plays in transition. He could be a difference maker in a game or two in this series, but playing him too much at Davis' expense on nights when he doesn't have it could also be costly. Bench and role player changes are less promising for the Grizzlies on the perimeter, but compared to last year's playoff series, there's nowhere to go but up. In that series, the Clippers got 25 points a game from the trio of Nick Young, Mo Williams, and Randy Foye, while O.J. Mayo imploded as the Grizzlies' unrivaled sixth man, averaging 9 points on disastrous 25% shooting. The Clippers again have the advantage in numbers, consolidating the off-the-bench shooting of Young and Williams into Sixth Man of the Year candidate Jamal Crawford, who was the Clippers' third leading scorer this season at 16.5 points per game. Crawford is an obvious “X” factor in the series because he's capable of getting hot and going for 20 or 30 points at any time. Crawford began his season with 29 off the bench on opening night against the Grizzlies and finished it by vanquishing Memphis' homecourt hopes with a couple of big shots late against Sacramento en route to 24 points. But Crawford also combined to shoot 3-17 in two contests against the Grizzlies since the Gay trade. It's hard to know what to expect from ostensible starter Chauncey Billups, who replaces Foye. Billups appeared in only 22 games for the Clippers this season, but shot 37% from three and poured in 17 points in only 19 minutes in the finale against the Kings. On the Grizzlies' side of the ledger, new sixth man Jerryd Bayless isn't likely to match both Crawford and Billups, but the comparison should be less of a route than it was a year ago. Bayless' role, minutes, and all-around production since the Gay trade is very similar to Mayo's last season coming into the playoffs. 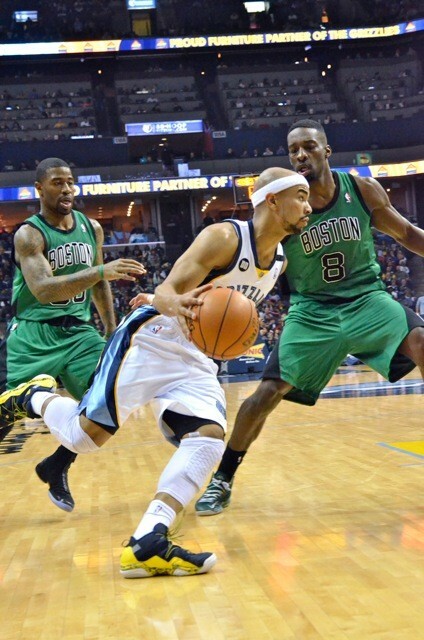 The hope will be that, unlike Mayo, Bayless can at least maintain something approximating his regular-season numbers. Bayless is better with another ballhandler on the floor than when paired with Tony Allen or Quincy Pondexter in the backcourt, but is still a better bet to handle the Clippers' pressure than Mayo was. I'm not sure how much late signee Keyon Dooling will actually play in the series, but he should also be an upgrade — because, again, how could he not be — over his precursor, Gilbert Arenas, who came into the last postseason with a gimpy wrist and balky knee and proved virtually unplayable. Dooling was taken apart by Bledsoe in four minutes against the Clippers last week, but has looked okay in other games down the stretch. He seems to have retained enough during his layoff to be a viable spot-up shooter and defender as long as he's not asked to do too much with the ball. The bet here is he gets spot minutes in the series, but if he's in the game against Bledsoe, the team will likely assign someone else (Bayless, Prince) to bring it up. I don't think the Grizzlies' bench needs to match the Clippers bench in the series — more on that next — but it would be helpful if the comparison is not overwhelmingly in the Clippers' favor. Unless Crawford goes off — and he just might — I think the Grizzlies' bench/role players have a chance to hold their own against their deeper, glitzier Clippers rivals. Jerryd Bayless should be able to top O.J. Mayo, but matching Jamal Crawford is a longshot. 8. Lineup Lessons: The Grizzlies poor fourth quarters against the Clippers are a prime concern going into the series, and we've talked about a couple of the big reasons for that — Bledsoe's defense on Conley and Gasol's offensive disappearing act. But a key third reason has been the performance of the bench-heavy lineups that have started fourth quarters for the Grizzlies. The Gilbert Arenas-Hamed Haddadi combo that opened the final quarter in Game 7 last spring was notorious. But equally instructive, I think, is what happened the last time these teams met, which included a decisive 14-0 Clipper run in the fourth quarter against a lineup of Jerryd Bayless-Quincy Pondexter-Austin Daye-Darrell Arthur-Zach Randolph. That lineup had all three of the Grizzlies' best playmakers — Mike Conley, Tayshaun Prince, and Marc Gasol — on the bench at the same time, and my feeling is that that's best avoided in the playoffs, where the Grizzlies might do well to tighten their rotation a little while staggering the rest of Conley, Prince, and Gasol so that at least one of that trio is on the floor in all meaningful minutes. The Clippers are so deep — Grant Hill is their third small forward; Willie Green, who has started most of the season, is their fifth guard — that it's difficult not to play deep into their bench. But the Grizzlies seem suited to play a core seven players — the starters, along with Jerryd Bayless and Ed Davis — with lesser rotation minutes from Quincy Pondexter and Darrell Arthur and maybe stray minutes with Keyon Dooling if Bayless is struggling as a lone true guard. It's difficult to draw strong conclusions about lineup data for the Grizzlies given the relatively few games the team has played with its current core roster. Only three line-ups have played more than 50 minutes together. The starting lineup (588 minutes) has been very good with a +10 rating per 48 minutes, and it's been even better against the Clippers, outscoring Los Angeles 83-69 in 43 minutes. The other two lineups with more than 50 minutes on the season would substitute Bayless for Allen (88 minutes) and Davis for Randolph (76 minutes). Both have been very strong, with a +22 rating each. Given that he's only played 16 minutes across two meetings with the Clippers, there's no indication that Davis will necessarily be a clear-cut third big in the series, but the number point that way. Lineups featuring Davis and Gasol have been terrific and those featuring Davis with either Arthur or Randolph have been respectable. Lineups featuring Arthur with either starter have been pretty bad this season. Playing Davis as a third big with Arthur getting lesser minutes, mostly alongside Davis, is what the data suggests. Again, with their preponderance of depth, it's hard to know exactly what the Clippers will do, but evidence suggests this could be another series driven by the Clippers' bench, with Eric Bledsoe, Jamal Crawford, and Matt Barnes all potentially more dangerous than their starter counterparts (minus Chris Paul and Blake Griffin). Foul when needed: The Clippers remain a bad free-throw shooting team across their frontline: Ryan Hollins shot a respectable 75% this season, but after that it's: Blake Griffin (66%), Lamar Odom (48%), DeAndre Jordan (39%), and Ronny Turiaf (37%). Jordan, in particular, should be given a “no layup” rule when at all possible. In the loss last week, the Grizzlies let him shoot 8-13 from the floor with all eight makes near the rim and no trips to the line. Pity the troll: I hope Memphis learned its lesson last spring as it pertains to the corny columnist schtick of life-hating Los Angeles Times scribe T.J. Simers, who got some far too riled up with his Andy Kaufman wannabe routine. Simers warmed up for this series in the Clippers' regular-season finale by mocking Kings fans for caring about the prospect of losing their franchise. 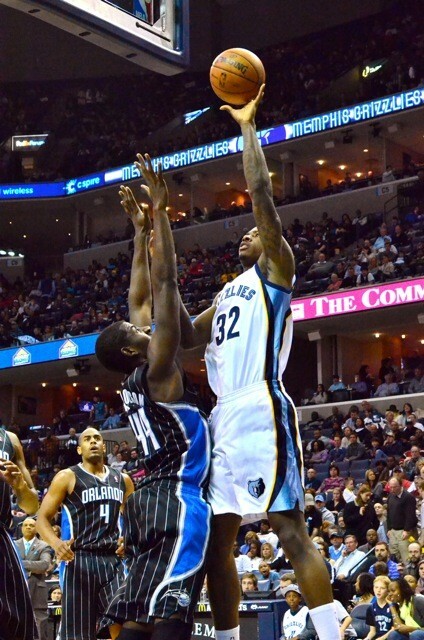 Playoff Debut: The most significant Griz player making a post-season debut: Ed Davis. If he shows nerves and Arthur plays well that could upend the notion that Davis is best suited to be the primary bench big. 10. Expectations: On paper, this should be a close series. Both teams finished with 56 wins in a tough conference. Both finished the season strongly. Homecourt doesn't seem to mean that much, as the home team has gone 5-6 in the 11 games these two teams have played in the past year. Still, the Clippers, by any objective measure, have to be favorite. In addition to the homecourt advantage, whatever it's worth, the Clippers have won seven of these 11 games, including three straight at FedExForum. They have the best individual player in the series (Paul). They have the clearest match-up edge (Bledsoe). They had a better point differential on the season (+6.5 to +5.1). They have better offense/defense balance and more viable options up and down the roster. I think it's particularly important for the Grizzlies to win one of the first two games in Los Angeles. If the Grizzlies come home down 0-2, after losing three straight to the Clippers at home and with the way the series played out last spring, I fear the mood in the building. While this series should be a memorable — if potentially anxiety-inducing — slugfest, it's too bad it's happening this early. With the Spurs and Nuggets (and, if it needs to be said, Lakers) injuries and with questions about how fully the Nuggets' regular-season style and effectiveness will translate to the postseason, I think there's a good chance that the three best teams in the West right now could be on the same side of the bracket — the Thunder, Clippers, and Grizzlies. Pick, unavoidably: Clippers in 7.